Web services are application components which communicate using open protocols. Using Web Services we can publish our application's functions to everyone. 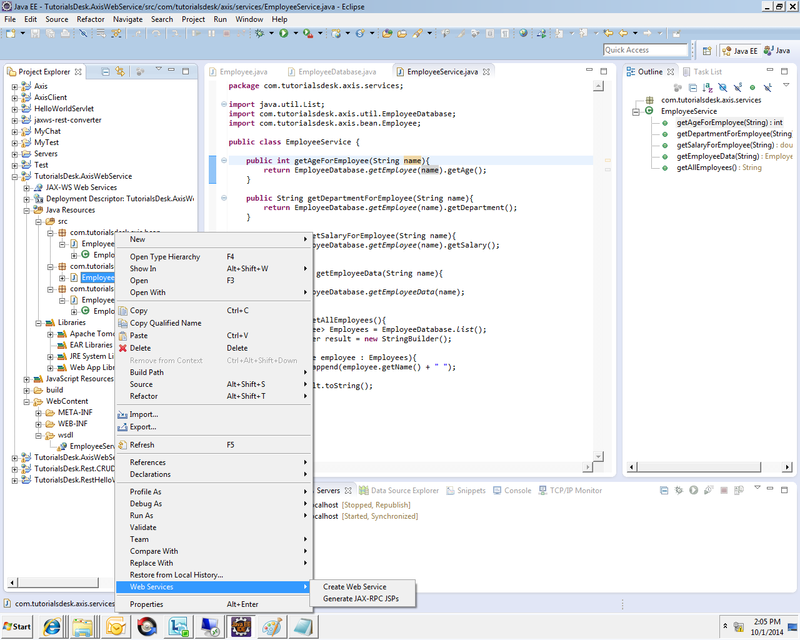 This tutorial provides step by step instructions to develop Web Services using Axis2 Web Services / SOAP / WSDL engine and Eclipse IDE. Let's start. Axis 2 is a web service/SOAP/WSDL engine provided by Apache. It is a java based implementation. Axis 2 provides complete object model and modular architecture. Using Axis 2 you can easily create a web service from a plain java class, send SOAP messages, receive SOAP message. Give your axis2 location in the Axis2 runtime location box. Give your Tomcat location in the Tomcat installation directory box. Let's develope a simple web application to demonstrate Java SOAP Webservices using Axis 2 and Tomcat. This Sample Application is all about querying information from a Web Application. For this, let us assume that we have a Employee Database maintained in the backend and we publish the various services to the Client in the WSDL file. 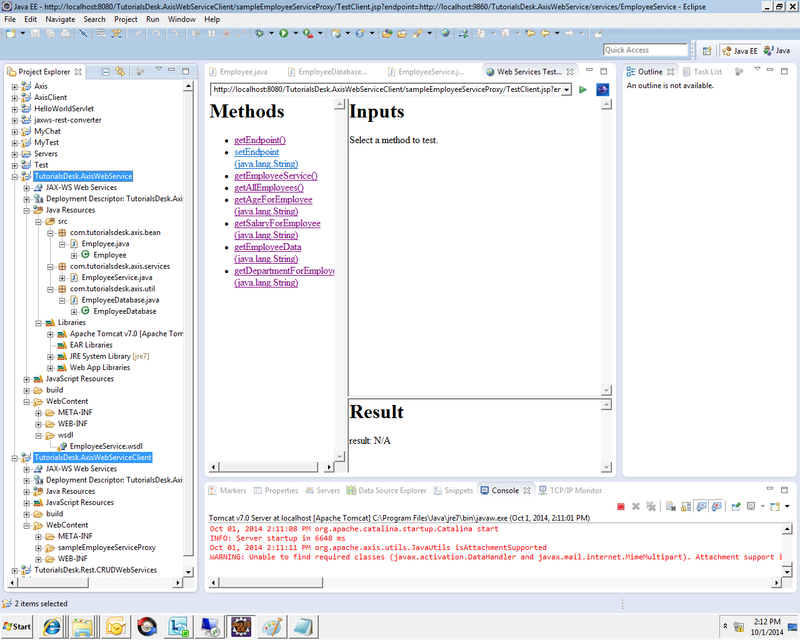 Both types of clients, Browser Client and Console Client are included in the sample Application. STEP 1 : Create a new Dynamic Web Project called TutorialsDesk.AxisWebService. STEP 2 : Create a package com.tutorialsdesk.axis.bean under TutorialsDesk.AxisWebService. STEP 4 : Create a package com.tutorialsdesk.axis.util under TutorialsDesk.AxisWebService. 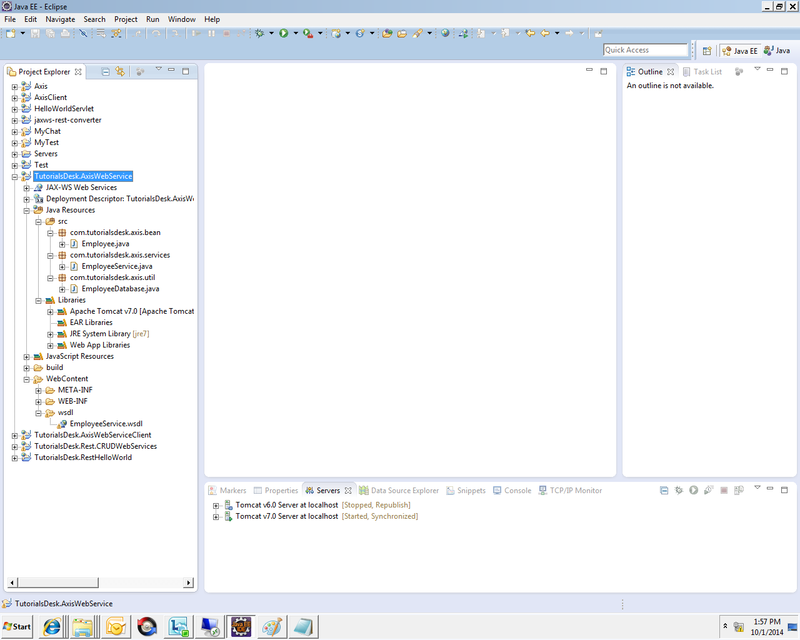 STEP 6 : Create a package com.tutorialsdesk.axis.services under TutorialsDesk.AxisWebService. 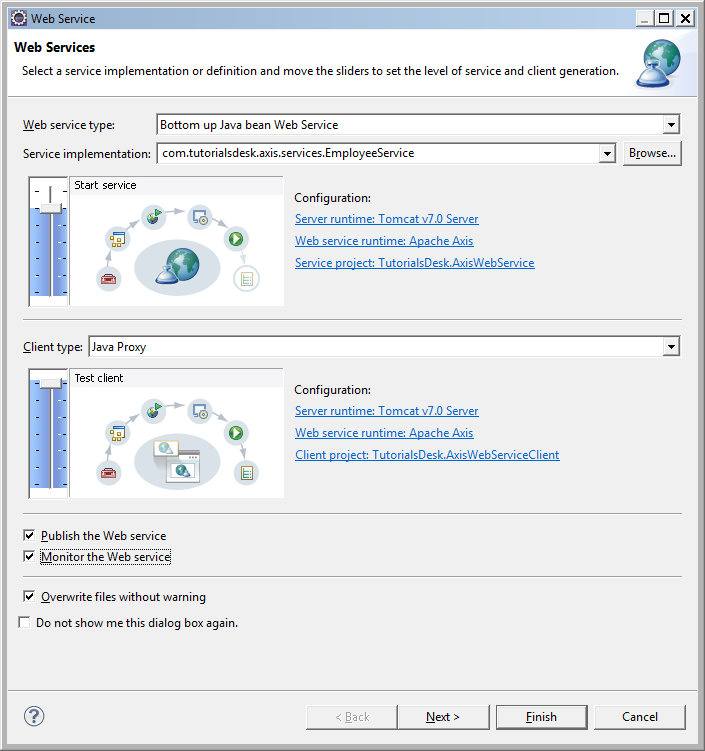 STEP 9 : Click on Web Services - > Create Web Service. 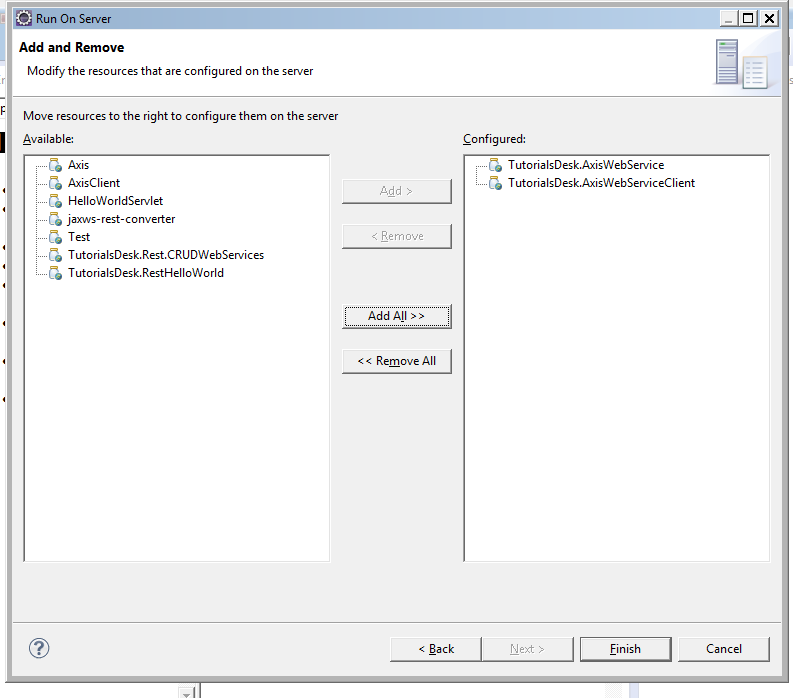 STEP 10 : Select options publish the web service and Monitor the web service. STEP 11 : Click on Finish. STEP 12 : It may take some time to finish all processes and you should see new project “TutorialsDesk.AxisWebServiceClient” created. Here is a final project structure. 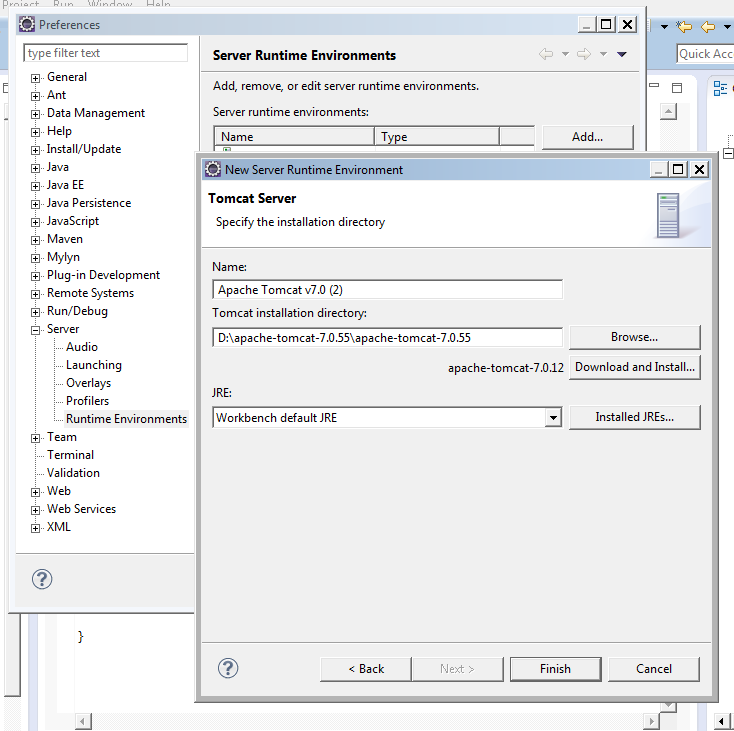 STEP 13 : “TutorialsDesk.AxisWebService” and “TutorialsDesk.AxisWebServiceClient” both projects should be automatically deployed to server. Let us see how to access the Web Service using the Axis Client API with a normal Console Client. Following is the code snippet for the same. Hope we are able to explain you Java SOAP Webservices using Axis 2 and Tomcat , if you have any questions or suggestions please write to us using contact us form. (Second Menu from top left).